This past Saturday saw downtown Frederick packed with people. They were mushed together on the sidewalk, shoulder to shoulder. Jammed together as if some great spectacle were about to unfold. And indeed, 25 cyclists were about to race around downtown Frederick, in a criterium style race. For those not in the know, a criterium, or crit for short, is a timed, hour long race. The racing takes place on a small closed course, often in an urban environment. There are plenty of hard corners, sprint points, little hills, and usually, a few crashes. It is, in short, a great spectator sport. You can see the racers go by a number of times, and if you stand in the right location, one can usually see a fair amount of the course. These 25 brave cyclists lined up at the start line sporting unique outfits and unique mounts. 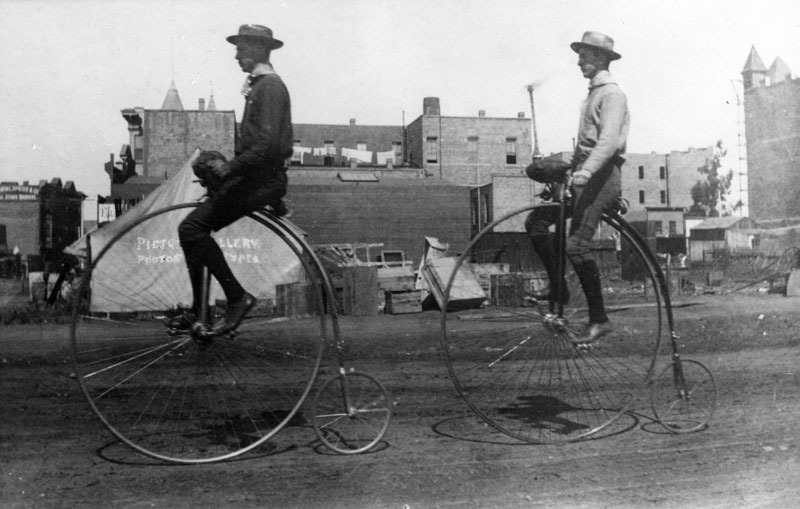 The look was 1880, and the bikes were vintage and reproduction high wheelers, also known as penny farthings. Big bikes with huge front wheels and tiny rear wheels. At best a rudimentary front brake. Solid rubber tires. Hard to handle, harder to race. A bike made for history buffs who live on the edge. 1886 in LA. Obviously they are on their way for a No Whip Soy Latte with extra vanilla. The crowds were huge. The weather was perfect. There was cheering, clapping and laughing. The tone race was fun. Riders catered to the crowd, with tricks, outrageous outfits and big smiles. Each lap went by quickly, and there was always something to see. I am sure downtown Frederick pulled in a bunch of money, as the race ended dinner time. I was watching with a knot of cyclists, and all of us were saying how this boded really well for future races in Frederick City, something that has only ever been tried out, on a much smaller scale in Baker Park. We knew that we could point to this event with pride, a prime example of how a race should and could be run. It was ammo for our future arguments! Eric Rhodes, on the left there, organized the event. Then tragedy struck. Final lap, racers exhausted but pushing it. Two wheels touched, and Alison Tropey, a racer sporting a flashy green jockey outfit was on the ground, having fallen from her high perch onto the curb in a high speed corner. Assistance was immediate, but the injury severe. She was flown out to a shock trauma center in Baltimore. Condition Critical. I heard today that she was going to be released with the next few days, after a few tests, but the general outlook is positive. Seeing Alison on the ground made my heart wrench. I watched from 20 feet away as she was loaded onto a stretcher. She was perfectly still, to the point where we assumed she had been knocked cold by the impact. She was, for the record, wearing a contemporary helmet. Alison is an experienced rider. Her antique bike is a hard beast to handle, but we watched her ride it with aplomb for a solid hour. Her accident was just that, an accident. In any race situation there is the possibility for such an incident to occur. Racers have to sign wavers to that end. They know what they are getting into, 100%. But none of this allays the pain we feel on a human level. And none of it will matter when we bring up all of the good things about the race to the city in the future. The crash is a moral black spot on a grand day, and an otherwise highly successful race. When future races are proposed, anyone could shut it down, just by bringing up that crash. It doesn’t matter that people are killed on route 15 or I-270 on a semi routine basis. It doesn’t matter that you can trip on the sidewalk and get a very similar injury as Alison. Every time someone gets creamed on a bicycle by a car, it scares 20 people off of the roads. A week doesn’t go by when we hear about someone who is afraid of the road because they saw X or Y article about a bike fatality. Bicycle crash stories are blown way out of proportion. They are different than car crashes, and it’s easy for people who don’t ride to get riled up about them. Statistical context is everything however, and bicycling is statistically way safer than walking, running, boating, hiking or driving. In Maryland, 1.3 people out of every million are killed on a bike each year. In 2010, nationwide, 32,885 people died in cars. 618 died on bikes. The majority of those injuries happened at rush hour, in urban environments. The riders typically were in their early 40’s. Commuters, in other words. The National Highway Traffic Safety Administration does not tell you whose fault the accident was, just that it happened, leaving you to make your own guesses as to who was on their cell phone when the accident went down. I hope city and county officials are going to be able to look behind Alison’s unfortunate wreck. We wish her the best, and we have our fingers crossed for the future of cycling events in Frederick as well. ← Who you jivin’ with that Cosmik Debris?